• Order, download, and install your CalcuPak. • Launch your CalcuPak. Your CalcuPak window shows the units in your Pak and the subjects they cover. • Click on the --Select Unit-- button to choose the unit you want to print drills and/or keys from. covers basic and advanced addition, subtraction, and multi­plication, basic div­ision, and stylus skills and basic penmanship! covers long divi­sion, deci­mals, estimating, fractions and mixed num­bers, per­cents, English and Metric units, geometric concepts, and dictionary skills! • After selecting the unit you desire, browse the drill Levels and keys in that unit. Other units are just a click away. • Click and Print Levels, QuicKey® grading keys,	 and Achievement Records	 in the quantities you desire. • The beautiful, high-resolution prints are a pleasure to use with your students! • As you browse through the drill Levels, click the handy SmartGuide™ buttons for key guidelines, plus practical hints and tips on how to use & admin­ister the drills. So helpful! • In addition, the SmartGuide has specific in­formation for each drill, including new facts and skills covered and specific teaching reminders keyed to each drill. Steps 4-8 describe the use of the 'Home Edition' CalcuPaks. The timing features of Teacher's Edition and School Edition CalcuPaks provide other options. Enter your children’s first and last names and birth order on the enrollment page. Be sure to click the 'Active' button for kids you want to time. Up to ten students may be enrolled, and up to five may be 'active' at once. Click on the 'Time Your Students!' button in the lower right portion of the enrollment page to go to the CalcuClock™ timer. Note: Once students are enrolled and active, click the 'Enroll & Time Your Students!' button on the CalcuPak home page to go straight to the timer. One of the great CalcuPak features is the Calcu­Clock™ timer and analyzer. With the CalcuClock, you can time up to five students at once, each on their own drill Level. As each student finishes, you record their time with the click of a mouse! 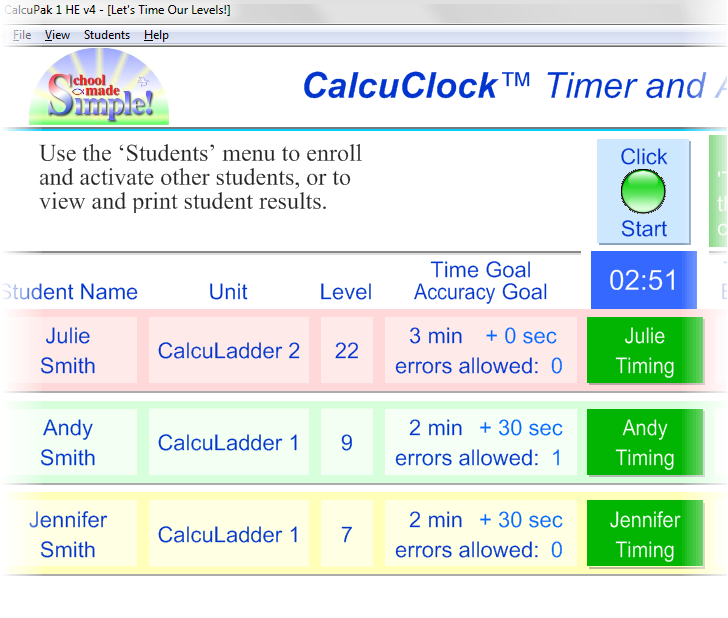 The CalcuClock automatically computes a Speed Quality Score or SQS for each student. Once your kids are finished, grade their papers with the handy QuicKeys® you’ve printed out. Then enter their number of errors on the CalcuClock screen. The CalcuClock automatically computes an Accuracy Quality Score (AQS) and an overall Performance Quality Score (PQS) for each student. These are displayed numerically and graphically. Clear each student’s results for timing again. printed out in handsome reports! Saved drill archives are available for printing, so you have a permanent record of your kids’ long-term performance. • Select the student’s unit. • Select the student’s Level. The CalcuClock ‘knows’ the suggested time goal for each Level, how many answers are possible, and so on. 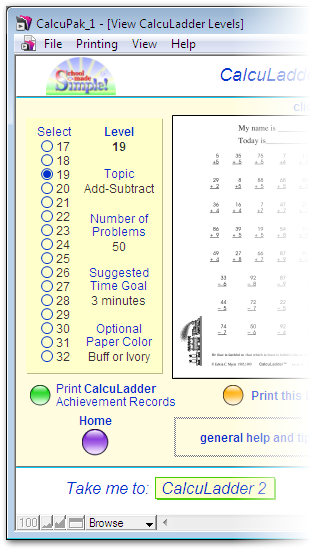 • Enter any adjustments you want to make for your student’s time goal on this Level. Usually, you should start with zero seconds adjustment. • Enter any adjustments for your student’s allowed errors on this Level. Usually, you should start with zero errors allowed. • When you have entered all information for a student, the CalcuClock places that student on ‘Standby’. • Click the ‘Standby’ box for each student you want to time, to place that student on ‘Ready’ status. Only 'Ready' students will be timed. Now, let’s go to the next step and time our students! • Say, “On your mark, get set, go!” Then click the Start button to begin timing. The ‘Ready’ boxes will change to ‘Timing’ boxes and the clock will start to run. • As students finish their Levels, click their ‘Timing’ boxes. The ‘Timing’ boxes will change to ‘Done’ boxes and each student’s time will be recorded. Notice that Julie’s Speed Quality Score is greater than 1000 because Julie finished her Level faster than her time goal. • When all students have finished their Levels, the CalcuClock panel looks like the illustration below. Note the question marks indicating that the number of errors should be entered for each student. That's what we will do next. • When all students have fin­ished, score their Levels with the QuicKeys® you’ve previously printed. • Enter each student’s number of errors on the CalcuClock page. Their Accuracy Quality Score and Performance Quality Score will display on the screen automatically. • Once all errors have been entered, click on each student’s ‘Done’ box to return that student to ‘Ready’. When you do this, you will be given the option to save the student’s results for future print-out. Clicking the ‘Standby’ box repeatedly will toggle it between ‘Ready’ and ‘Standby’. To access, view, and print student records from the CalcuKeeper™ archive, select 'View/Print Student Records' from the 'Students' menu. 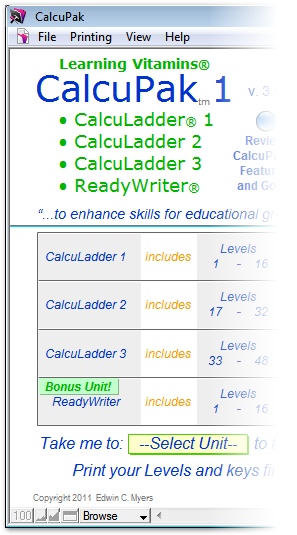 On the CalcuKeeper page, choose the student, unit, and Levels of interest. Then click the green 'Print Results Now Showing' button to print out professionally formatted reports of student progress. or order both Paks and save more! Teacher’s Edition and School Edition also available!